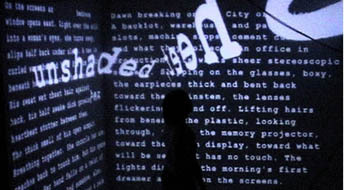 San Diego, CA, July 18, 2007-- The University of California, San Diego will host three days of digital art performances and installations by international artists and technologists who illuminate the role digital media play in shaping, extending, and reflecting our view of the world. The cutting-edge program will take place August 4-6 at the California Institute for Telecommunications and Information Technology (Calit2) and the Center for Research in Computing and the Arts (CRCA) at UC San Diego. 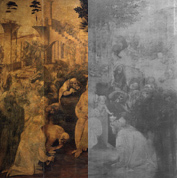 New technology developed at Calit2 allows the viewer to "walk" through the surface of Leonardo da Vinci's "Adoration of the Magi" to reveal Leonardo's original underdrawing (at right) that was hidden for more than 500 years. Digital art performances that expand awareness of people and nature, and illuminate the role digital media play in shaping, extending, and reflecting our view of the world, will be presented as part of the SIGGRAPH 2007 Art Gallery: Global Eyes . The innovative, new-media performances and site-specific installations are part of the SIGGRAPH Art Gallery : Global Eyes, a component of SIGGRAPH 2007, to be held this year at the San Diego Convention Center August 5-9. Registration for the conference and exhibition is open to the general public and will attract approximately 25,000 computer graphics and interactive technology professionals from around the world to San Diego . "This is a wonderful opportunity to bring some of the world’s leading performance artists to these state-of-the-art venues for a comprehensive program that will lift the eyebrows of even the most discriminating performance art critics," stated Vibeke Sorensen, SIGGRAPH 2007 Art Gallery Chair from the University at Buffalo. "Global Eyes is an exciting forum for showcasing alternative ways to think about nature and art, and how the two interact." 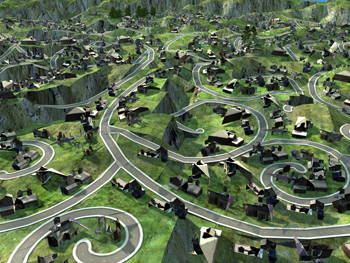 Sheldon Brown's Scalable City will be shown at the San Diego Convention Center during SIGGRAPH 2007. "There are very few facilities in the entire country that could do justice to the imaginative and daring works that will be staged during this three-day period," said Yadegari, who is also the SIGGRAPH Art Gallery Performances Subcommittee Chair. "Calit2 and CRCA have contributed facilities, funding and personnel to spotlight these performances and installation, and we expect that many attendees at SIGGRAPH-and members of the public-will make the trip to UCSD to see these works staged in a venue designed to showcase new media arts." A second art panel at the Convention Center will be moderated by Bill Tomlinson, a Calit2 participate from UC Irvine. The August 9 panel on "Global Environment and Digital Media" will include Yadegari, UCSD visual arts professor Natalie Jeremijenko, UCSD graduate student William Brent, SIGGRAPH 2007 Art Gallery Chair Vibeke Sorensen from the University at Buffalo and other experts. They will explore the use of graphical and interactive technology for art relating to global environmental issues. CRCA's Noah Wardrip-Fruin will show his piece Screen for visitors to SIGGRAPH @ UC San Diego. Free shuttle buses will be available to Atkinson Hall from the Hall B Lobby of the Convention Center. SIGGRAPH attendees are able to register at the Convention Center, and the events are open to the general public as long as they register as a SIGGRAPH attendee at one of several registration levels. Some seats at all performances at UC San Diego will also be reserved for UCSD faculty, students and staff free of charge, but advance registration is required. UCSD students and employees only are asked to register to attend specific performances by going to the SIGGRAPH @ UC San Diego website at http://siggraph.calit2.net and clicking on the Register tab. A full list of showtimes and event descriptions can be found at the website. For all other Art Gallery and general SIGGRAPH information, visit www.siggraph.org/s2007/. For further information, email siggraph_2007@calit2.net. Media Contacts: Doug Ramsey, 858-822-5825, dramsey@ucsd.edu and Brian Ban, 773-454-7423, media@siggraph.org.